Occasionally one comes across a collection of poetry which seems to come out of left field. 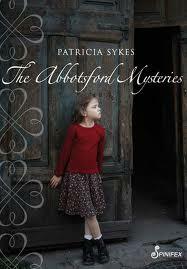 Such was the case with Patricia Sykes’ third major collection The Abbotsford Mysteries. After reading the first few poems I had to take a deep breath and put the collection down for a few minutes. I realised that I was embarking on something special – how come I had missed her first two books? The Abbotsford Mysteries is not just a collection of poems, though there are some very fine poems in this book, it is a narrative, a poetic history of the girls who passed through the Abbotsford Convent as young orphans or as girls whose parents could no longer care for them. While initially the title might hint at an Enid Blyton type of adventure (The Secret Five and the Mystery of the Abbotsford Convent), it very quickly becomes clear that we are talking of ‘mysteries’ in a religious/Catholic sense. The mystery can be seen the ‘mystery of the sacraments’, the magic of water turning to wine, bread becoming flesh and so forth. There is the suggestion of the mystical, the magic something that we can observe but not fully understand unless through faith. There is also mystery surrounding the girls who bring the poems in this collection to life: how did they end up in the convent? What happened to their parents? What happens outside of the walls? How to relate the Christian ‘mysteries’ they are taught by the nuns to the way they are treated and to the secular world outside? Adding to this ‘mystery’ is the way the collection is structured in 5 main sections each containing ten poems, reflecting the structure of one of the most common forms of the Catholic rosary – A five decade rosary contains five groups of ten beads (a decade). This structure becomes even more significant when we realise that the names of the different ‘mysteries of the rosary’ (the topics one is supposed to mediate on as they advance through the rosary), is reflected in the title of each section – such as ” The Luminous”, “The Sorrowfuls”, “The Joyfuls” and ” The Glorious”. Given this The Abbotsford Mysteries can almost be seen as a secular mystery, linking the history and emotions of the girls who passed through the convent. While we have religious symbolism almost dripping from the pages, it is the strength of the poems, both individually and in the way they ar grouped together, which makes this such a unique collection. As sudden as that. A breath taken. Then not. Then steps. A travel. To place the orphans. Between these two deaths, the death of the parent and the dying off of the aging orphans, there are some very fine poems. Here the secular world outside of the walls has merged with the sacred. A prayer has become a poem, the neon sign, a false idol. But an idol which suggests of escape and a life after the institution. Overall, while the individual poems stand alone as substantial achievements, taken as a whole they are collectively much greater than the sum of their parts. Patricia Sykes has combined a skillful poetic technique with a carefully structured collection which provides a stunning canvas for her to bring to life the voices of the girls who passed through the Abbotsford convert as orphans. Already an established poet and librettist, The Abbotsford Mysteries has firmly cemented Sykes reputation as a major poet. I will chasing up her earlier works (including her texts for music) and looking out for her next collection with anticipation. This entry was posted in Issue 3, Mark Roberts, Patricia Sykes, The Abbotsford Mysteries and tagged Abbotsford Convent, Catholic rosary, mysteries of the rosary, Spinifex Press, The Glorious, The Joyfuls, The Luminous, The Sorrowfuls by Mark Roberts. Bookmark the permalink.